Toronto FC entered the CONCACAF Champions League final as the favourite against Mexican side Chivas Guadalaraja. How quickly things have changed. A 2-1 loss at home in Tuesday’s opening leg of this two-game, aggregate series means TFC have a lot of work to do in the return match. To be sure, the Reds are in a tough spot, needing to win by two goals next Wednesday at Estadio Akron in Guadalajara. It’s a tall order for any Major League Soccer team, even the reigning MLS Cup champs. But it’s not hopeless. In fact, it’s doable. Here are three important points TFC have to keep in mind ahead of their trip to Mexico for the decisive second leg. Chivas’ furious and dogged man-to-man marking style gave TFC plenty of fits on Tuesday night. But for Greg Vanney, that’s not why they lost. Instead, the Reds’ coach bemoaned his team’s lack of finishing in front of the goal. In total, Toronto out-shot Chivas 18-15, and registered seven shots on net, forcing goalkeeper Miguel Jimenez to make some crucial saves. His best stop came in the first half when he athletically tipped away a Sebastian Giovinco free kick that looked destined to nestle inside the near post. But TFC’s attackers also repeatedly let Jimenez off the hook, shooting right at him and not making him work to make a save when they had a clear eye on goal. Late in the first half, Giovinco played a sublime, back-heeled pass for Jozy Altidore that sent the American through on goal. His tame effort was comfortably stopped by Jimenez. Then early in the second half, the home side caught out the Mexicans on the counter, and Giovinco set up an unmarked Marky Delgado near the top of the penalty area. Instead of taking his time, Delgado rushed his shot and ballooned it over the crossbar. Chivas have conceded just twice in this tournament, both times on the road. Jonathan Osorio’s tap-in in the first half on Tuesday night ended the Mexicans’ shutout streak in CONCACAF play at 301 consecutive minutes. Chivas simply don’t give up many goals, so TFC has to continue to create scoring chances in the second leg and bury them. They can’t afford to be as wasteful in front of the net as they were in the first leg. It seems obvious, but it’s easier said than done. It wasn’t necessarily Chivas’ swarming defensive style that led the to victory in the first leg, although that certainly played a part, as the visitors made it difficult for Toronto to build out from the back. Often times, games are won and lost on errors, and a team’s ability to capitalize on them. That was the case on Tuesday night. “I don’t think the outcome was based on the style of play, I think the outcome was based on them finishing a couple chances that we should’ve dealt better with [defensively]. We had a couple looks [on goal] that we wish we could take back, but that’s how games are contested like that sometimes, that’s how the results play out,” Vanney explained. It was slack defending by TFC that led to Chivas’ opening goal within two minutes. Midfielder Isaac Brizuela took a throw-in deep in the Reds’ end and, when the ball was played back to him, he easily breezed past Ashtone Morgan, cutting the ball back into the middle of the box from the end line. His pass found its way to the feet of Rodolfo Pizarro, who stabbed it home past a helpless Alex Bono. Then in the 72nd minute, after Drew Moor committed a foul, Alan Pulido floated what looked like a harmless free kick from the left flank into the box. It turned out to be anything but harmless, as Bono misjudged the flight of the ball, stepping forward when he should have taken a step back to catch it. The ball sailed over his head and inside the far post. “It [was] definitely a misread on my part,” Bono admitted. Down 2-1 and having conceded two road goals, TFC have it all to do in the second leg. The margin for error is razor thin. They can’t make those same kinds errors in the return match. If they’re going to pull off the comeback, they have to play mistake-free soccer in Guadalajara in order to give themselves a chance. 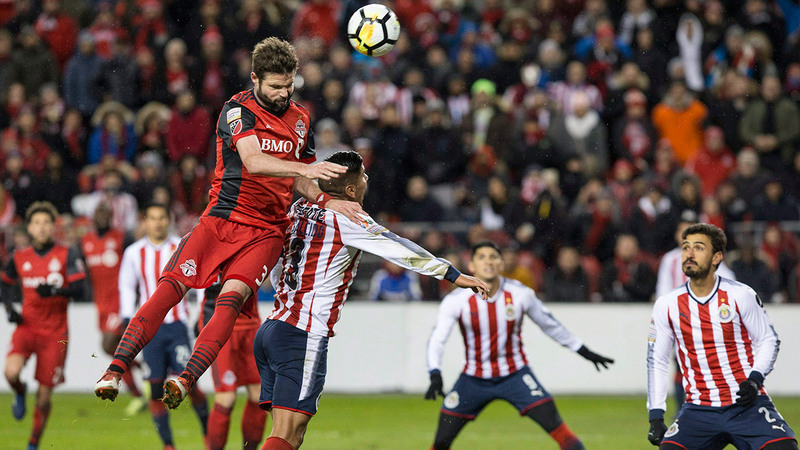 One of the bright spots for TFC on Tuesday night was how it battled back after Chivas’ Rodolfo Pizarro scored within the opening two minutes. That early goal seemed to rattle Toronto, as it looked to gets its bearings under a constant wave of pressure from the Mexicans. Slowly, though, the MLS Cup champs regrouped, regained their composure, and levelled the score in the 19th minute through Osorio, with Delgado and Altidore playing critical roles in the buildup to the Canadian’s goal. The Reds didn’t change their approach after going down early in the game. They stuck to their tactical game plan, confident in the fact that they could overcome that setback and work their way back on top. Their patience was eventually rewarded. A similar approach will serve them well in Mexico next week. They have 90 minutes to score two goals. There’s no need for Toronto to rush things, or be cavalier in their decision making, looking to score early to put immediate pressure on Chivas. Patience is the key.